After a string of mild winters we finally got a good dose of some unseasonably cold weather this year. Although it was short-lived (near 80 today), it did get cold enough to drop our water temps significantly. While it has certainly tempered the ridiculous snook bite, it has allowed our more tolerant wintertime species such as the sheepshead and trout to flourish. The predominant bait typically used this time of year is shrimp which is very effective and will catch anything that swims. This time of year though, I also like to use artificial lures that allow us to cover more water and often even outproduces live bait. Soft plastics such as those from DOA or Z-Mann on a 1/8th oz jig head or rigged weedless with a weighted worm hook are my favorites. For colors, root beer, black/gold and new penny seem to work best. The key is to slow that presentation way, way down for best results with this cooler water, especially for those big trout that are lurking this time of year. 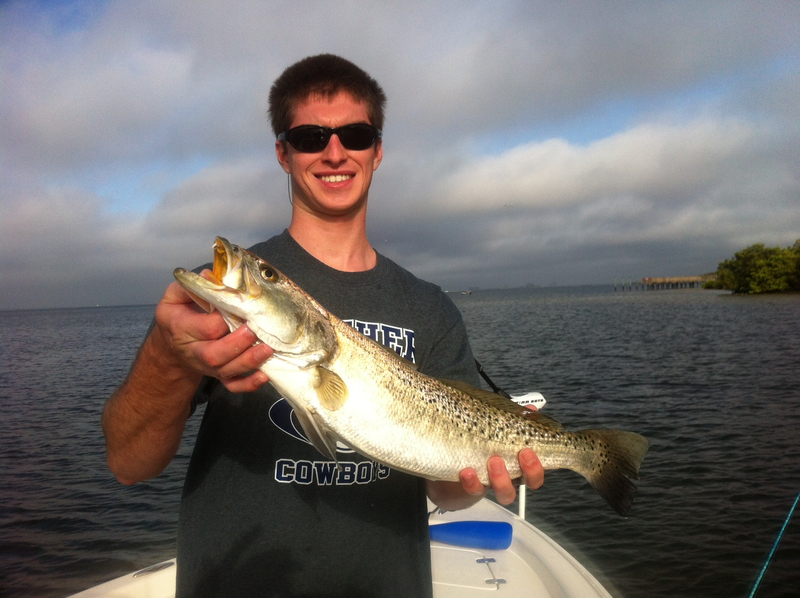 It has been a great year for trout too with large schools of fish over the deeper grass flats. It seems as though when one is found usually several dozen will follow. We also target residential canals and docks this time of year as many species seek refuge in the deeper, darker water found there. 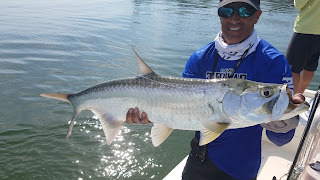 The docks hold plenty of sheepshead, redfish, snapper and snook while in the deeper areas there are jacks, ladyfish, trout and even some juvenile tarpon. The power plants are always productive in cooler temps due to their warm water outflows and this year is no exception. The waters have been crystal clear which allows us to sight cast to cobia and sharks as they prowl the shallow flats. So even though we are enduring one of our toughest "winters" in some time, Tampa Bay is alive! Not only are some tasty fish to bring home or keep rods bent, there are also huge flocks of migrating birds along with dolphins and manatees seemingly everywhere. Bridget with her first snook!! Copyright 2016 Triple C Charters All Rights Reserved. Simple theme. Theme images by konradlew. Powered by Blogger.